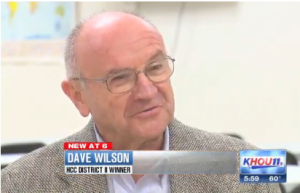 County officials have dropped their request to temporarily keep Houston Community College trustee Dave Wilson from his office in favor of an expedited trial date that will allow jurors to decide if he lives in District 2. Last month, the county sued to prevent Wilson from serving on the HCC board amid questions about his residency. On Tuesday, First Assistant Harris County Attorney Robert Soard confirmed that the county will stop pursuing immediate legal action against Wilson in exchange for a civil trial beginning on April 15. Wilson is ready for a jury to consider the case. The temporary restraining order preventing Wilson from taking his seat had already been lifted, so it’s not a huge concession to quit fighting that battle. I have no doubt that both sides would like to get the core issues resolved, so an expedited court date makes sense. I can’t wait to see what happens.